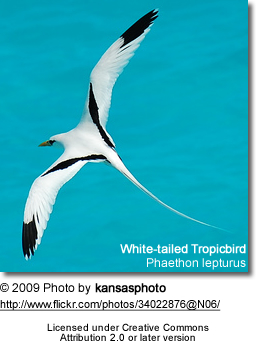 Tropicbirds are a family, Phaethontidae, of tropical pelagic seabirds now classified in their own order Phaethontiformes. Their relationship to other living birds is unclear, and they appear to have no close relatives. There are three species in one genus Phaethon. They have predominately white plumage with elongated tail feathers and small feeble legs and feet. 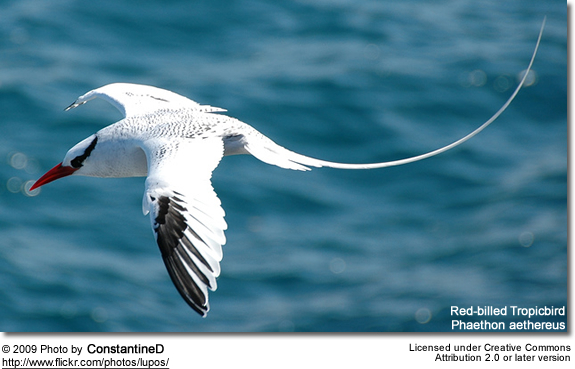 Tropicbirds range in size from 76cm-102cm in length and 94cm-112cm in wingspan. Their plumage is predominantly white, with elongated central tail feathers. The three species have a different combination of black markings on the face, back, and wings. Their bills are large, powerful and slightly decurved. Their heads are large and their necks are short and thick. Like other members of their order, their feet are totipalmate (that is, all four toes are connected by a web). 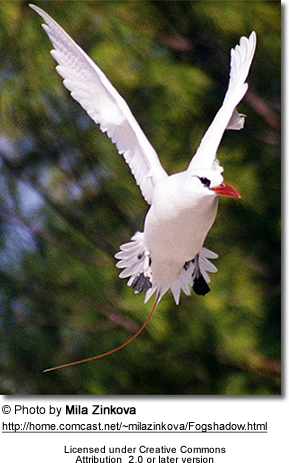 The legs of a tropicbird are located far back on their body, making walking impossible, so that they can only move on land by pushing themselves forward with their feet. The Tropicbirds' call is typically a loud, piercing, shrill, but grating whistle, or crackle. These are often given in a rapid series when they are in a display flight at the colony. Recent research suggests that the Pelecaniformes as traditionally defined are paraphyletic too. The tropicbirds and the related prehistoric family Prophaethontidae are considered a distinct order, Phaethontiformes, not closely related to any other living birds. They are more distantly related to the Procellariiformes (Mayr, 2003; Bourdon et al., 2005). Within the group, the Red-tailed and White tailed are each other's closest relatives, with the red-billed a sister taxon of that group. Heliadornis is a prehistoric genus of tropicbirds described from fossils. Tropicbirds frequently catch their prey by hovering and then plunge-diving, typically only into the surface-layer of the waters. They eat mostly fish, especially flying fish, and occasionally squid. Tropicbirds tend to avoid multi-species feeding flocks as opposed to their sister Frigatebirds. Tropicbirds are usually solitary or in pairs away from breeding colonies. There they engage in spectacular courtship displays. For several minutes, groups of 2–20 birds simultaneously and repeatedly fly around one another in large, vertical circles, while swinging the tail streamers from side to side. If the female likes the presentation, she will mate with the male in his prospective nest-site. Occasionally, disputes will occur between males trying to protect their mates and nesting areas. Tropicbirds generally nest in holes or crevices on the bare ground. The female will lay one white egg, spotted brown and incubate for 40-46 days. The incubation is performed by both parents, but mostly the female, while the male brings food to feed the female. The chick hatches with grey down. It will stay alone in nest while both parents search for food, and they will feed the chick twice every three days until fledging, about 12-13 weeks after hatching. The young are not able to fly initially, they will float on the ocean for several days to lose weight before flight. Tropicbird chicks have relatively slow growth relative to a nearshore bird and they also tend to accumulate fat deposits while young. That, along with one-egg clutches, appears to be an adaptation to a pelagic lifestyle where food is often gathered in big amounts, but may be hard to find.